US TV network NBC has announced that it is partnering up with Amazon's US download service to release its TV shows online. It comes less than seven days after NBC and Apple decided not to renew their old arrangement. NBC shows will reportedly still be available on iTunes until later in the year, but under the new deal NBC shows have gone live on Amazon Unbox with immediate effect. Apple had previously claimed that NBC wanted the wholesale rate for each episode, which currently stands at $1.99 (£1), to be doubled. NBC holds some pretty persuasive content cards, including the new series of Heroes, due to begin airing in the US later this month. The company has so far been the largest supplier of shows to the iTunes service - around 40 per cent of those downloaded are NBC's. 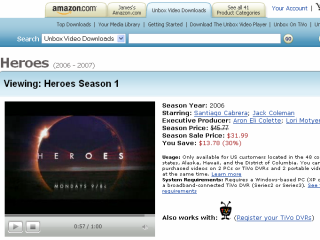 Under the new deal with Amazon Unbox, anyone in the US will be able to purchase and download entire seasons of NBC shows, which will be cheaper than buying the DVD version. Individual episodes will probably cost around $1.99 each, while the first season of Heroes can be obtained for $31.99 (£15).